Surely you already asked yourself how to find a forest mansion in MCPE 1.1.0? It would seem that there is nothing complicated here, but in fact it is quite a difficult task because you will need a map with which you can find this structure. The developers have slightly lied and did not add cartographers to the game but they promise to do it in the next beta version. How to get the treasure map? How to find the forest mansion? 1) If you are playing creative mode, then you only need to do one thing is to enter this command - /locate mansion. You teleport to the forest mansion and you can explore it without danger to life. 2) If you play survival mode, then the difficulties for you are just beginning. Use this seed to spawn next to the mansion. You have to go a little way and eventually reach the goal. 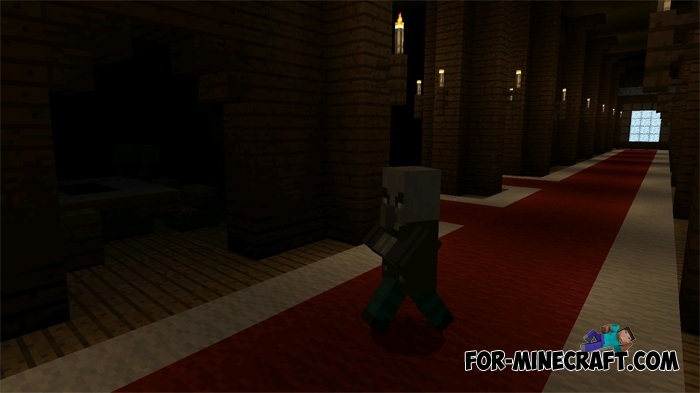 Entering the forest mansion, you can explore many rooms, such as libraries, bedrooms, farms and treasures. Watch this video and you will understand where to go. Try to find the main room with treasures, but be prepared for the battle, because this room is guarded by pretty dangerous mobs.